Students in introductory Management Information Systems (MIS) courses often ask what a career in MIS looks like. Lacking a clear vision, they make their own assumptions. Often they assume the career involves programming with little human interaction. That MIS is a technical field could not be further from the truth. MIS job descriptions typically require candidates to be able to collaborate, communicate, analyze needs and gather requirements. They also list the need for excellent written and communication skills. In other words, MIS workers are constantly interacting with other people both inside and outside the organization. They are coming up with creative solutions to business problems. Business Information Systems by Frost, Pike, Kenyo and Pels is designed to help students get a feel for what a career in MIS would be like. The authors' students report that they learn more about information systems from their internships than from their IS courses. Consequently, they designed a book that looks very much like an internship--an introduction to the field followed by a substantial project. The authors begin Unit 1 by introducing the information systems landscape. The unit kicks off with a discussion of all the usual suspects: the information systems triangle, the systems development life cycle, transaction systems (ERP, SCM, CRM), collaboration systems, and business intelligence systems. Other aspects of the landscape such as usability, outsourcing, database concepts and so forth are introduced throughout a chapter in unit 2 where they fit in naturally with the flow of the project. Unit 2 is the substantial project which runs over a number of chapters. Students will plan, build, and develop a proposal for an iPhone application. They will develop a very realistic mockup. They also build a website to help market and support the app. Students are engaged because the project is fun and feels real. However, they are simultaneously learning business concepts and MIS skills. With Designing Information Systems, even as freshmen, you can give your students an experience that emulates MIS in operation. 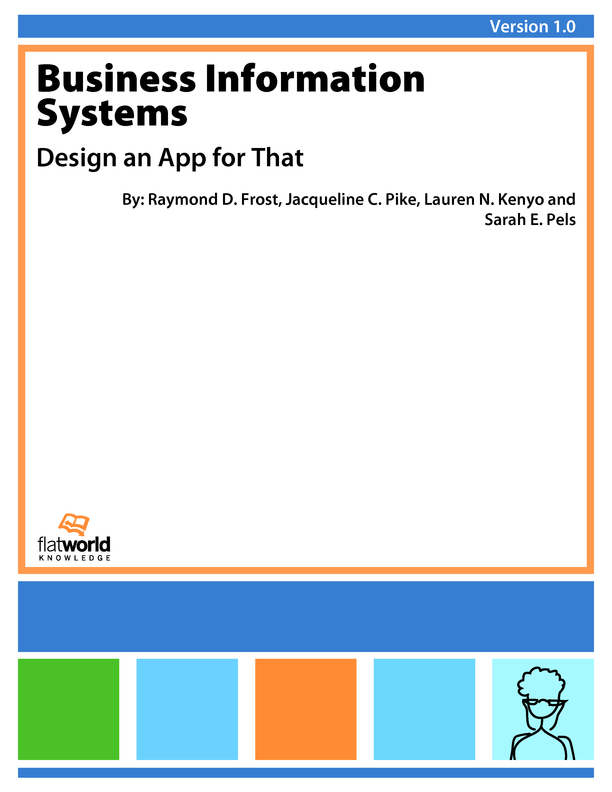 Business Information Systems: Design an App for That by Frost, Pike, Kenyo and Pels is a text that will help students learn Information Systems by doing Management Information Systems. Request a desk copy or examine the book online now to see how this text might work in your course or department. Teaching Information Systems Management? Flat World gives faculty the open license and tools to easily personalize textbooks online. Change words, move chapters -- now a textbook by expert authors precisely fits your syllabus, all at a fair price for your students. 1.1 What Are Information Systems? 2.2 What Is A Business Process? Raymond D. Frost is a Professor in the Management Information Systems department at Ohio University. He is also the Director of Studies for College of Business students in the Honors Tutorial College (HTC). Frost joined the College of Business in 1999. His primary research areas are instructional pedagogy, information design, and database design. He was named 2010 Computer Educator of the Year by the International Association for Computer Information Systems. He has also received multiple teaching awards at both the College and University level and holds the title of Director of Teaching Innovation. Frost earned a doctorate in business administration and an M.S. in computer science at the University of Miami (Florida), and received his B.A. in philosophy at Swarthmore College. He lives in Athens, Ohio with his wife, Tere, and their two boys, Raymond and Luke. Jacqueline C. Pike is an Assistant Professor of Information Systems Management in the Palumbo-Donahue School of Business at Duquesne University. She earned her B.B.A. from the Honors Tutorial College and College of Business at Ohio University and her Ph.D. from the Katz Graduate School of Business at the University of Pittsburgh. Her research interests include behavior in public online communities and social computing environments, the utilization of public online communities by organizations, human-computer interaction, and the visual display of information in a systems context. Lauren N. Kenyo is an instructor in the Management Information Systems at Ohio University. After graduating from Ohio University’s College of Business she went on to graduate from Ohio’s Masters of Business Administration Program. In 2004 Kenyo came back to join the faculty as an instructor in the Management Information Systems department. Kenyo currently resides in Streetsboro, Ohio with her husband, Eugene, and daughters, Kate and Brooke. Sarah Lebovitz is a doctoral student in Information Systems at New York University Stern School of Business. She earned a bachelor’s degree from the Honors Tutorial College at Ohio University and worked as a forensics technology consultant and business process analyst in the insurance industry. Broadly, her research seeks to understand the impacts of new technology on organizational processes and outcomes. She studies new forms of innovation, such as the accelerated innovation processes at hackathons and makeathons, enabled by open-source platforms and 3D printing technologies. Her recent interests are examining how data-driven technologies transform knowledge work in high-stakes decision making, such as the effects of artificial intelligence tools in medical diagnostics or human resources practices.